Firehole Geyser Basin. Geology Sheet XXII. 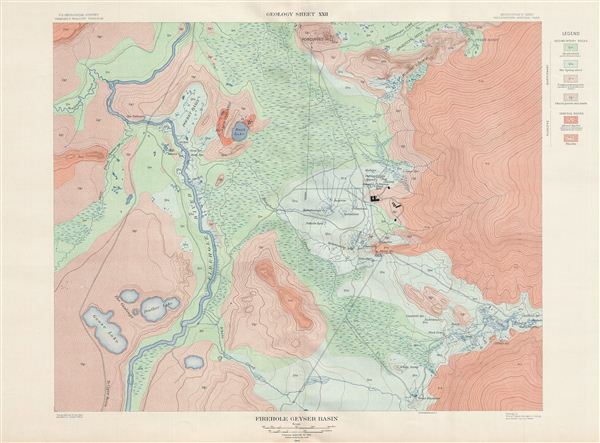 A fine example of Arnold Hague's 1904 geological survey map of the spectacular Firehole Geyser Basin in Yellowstone National Park, Wyoming. Focusing on the Firehole River, the map covers from Goose Lake, the Gooslings and Feather Lake northward, along the river, as far as Pocket Basin, Rush Lake and Ojo Caliente. Flowing along many famous geyser basins of the Yellowstone Park, the Firehole River is surrounded by numerous geothermal features. The map identifies numerous geysers and other sites of interest throughout, from the Great Fountain and Hot Lake to Porcupine Hill. This particular map was part of Hague's study of the regions unique geology and the related geothermal activity. The map is color coded to identify different geological zones with a detailed key to the right side of the map proper. Published by the United States Geological Survey in 1904.